Year number three of The Hangout Festival was bigger and better than before. 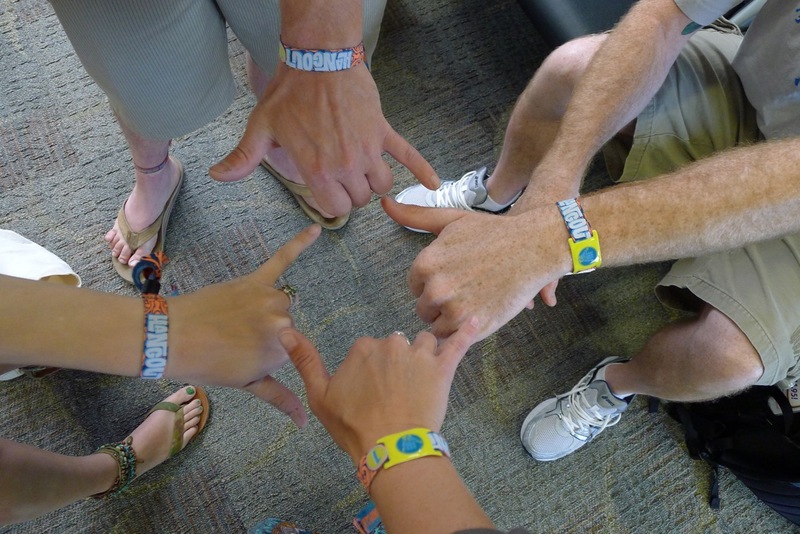 It seems promoters really listened to feedback from 2011 and were able to cut down on the insane entrance lines by mailing out the wristbands two weeks before the show, and increasing the availability of transportation in shuttles and “Catch a Chevy” to help get people safely around Gulf Shores. Keeping the attendance capped at 35,000 while spreading out the festival stages and increasing the grounds and water stations made for an amazing festival experience. Not to mention the pristine white sand beach and crystal clear gulf water as the perfect backdrop for an epic weekend. My group traveled from Maryland, and we met people from all over as far as Chicago and Colorado, and closer like Tennessee and Texas. Gulf Shores is used to a little summer tourism, but this weekend festival rivals spring break for the businesses in the area. The Hangout has become a personal favorite of mine, with the same great acts doing a lot of the larger festivals in what seems like a more intimate setting. Like in years past, there were three outdoor stages, one dance tent stage and a kid’s area with stage. The difference this year was the dance tent and The Letting Go stage were further out from the main Hangout Stage and Chevrolet Stage. This was a good move, for many reasons like sound overlap, and crowd overflow. My favorite change was moving the Letting Go stage from a blacktop parking lot last year to a grassy area across the road this year. This made for a way more comfortable concert setting, and less people passing out from dehydration. This year’s lineup meant general admission tickets were sold out by the end of February, leaving only VIP options up for grabs. Having had such a blast last year for my birthday weekend, I grabbed my early bird ticket right away before I even knew who was playing. Fortunately there were not a lot of schedule conflicts, and only a few things I felt I could not miss, so I was able to do the Hangout the way it is meant to be, laid back, going with the flow and “just beachy”. My later afternoon travel plans, meant I missed the Thursday kickoff which included a New Orleans flavor with Dirty Dozen Brass Band and Preservation Hall Jazz Band. Friday we tried to cram some beach time, before heading in to catch Alabama Shakes. This is a band that has blown up even before they had an official album out, and although it took the crowd a minute to get into the groove, “Hold On” had everyone singing along. I even caught Brittany Howard chatting up some fans after the set while we held down a place for M. Ward’s upcoming set. M. Ward is was one of my favorite sets, playing songs from a variety of his albums, including the newer peppier album “A Wasteland Companion”, as well as from She & Him, and even doing one of his Monsters of Folk songs. I could not stop taking pictures during this set; it was so exciting to be so close. Wilco was up next and great as always, playing a little something from their assortment of albums as the sun was setting over The Hangout. The palm trees light up bright blue, and the Ferris Wheel lights make patterns over the crowds. Jack White was the big finale for Friday, and he did not disappoint. The only thing I regret is that I didn’t weasel my way closer to the stage for some pictures, but at least I had some dancing room back near the soundboard! 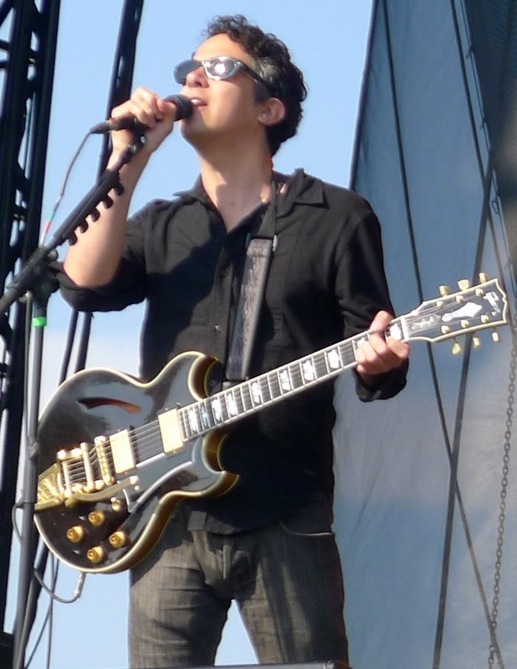 He started with an all male band of musicians, playing songs from Dead Weather, White Stripes as well as his “Blunderbuss” album. I was thrilled to hear “Two Against One” from Danger Mouse and Daniele Luppi’s 2011 album “Rome.” About halfway in or so, the stage went dark and when the lights came back on; White’s and was all female. The final song, Seven Nation Army accompanied by fireworks sent everyone home with a smile, and plenty of time to get rested for the next two music packed days. Saturday was a less “have to see” day for me, and more of a see what we get to. We started by catching part of Julian Marley, and getting his inspiring reggae vibe to get us dancing. Next was the Heartless Bastards, who’s 2012 album Arrow is already on my “Best of 2012” list. I am used to seeing them in much smaller venues, so this was a welcome change. We then bounced back to the Hangout Stage to catch Gary Clark, Jr., who’s single “Don’t Owe You A Thang” has gotten him a lot of radio play. Man, he has an amazing way with the guitar. He even popped back up on Sunday to play the BP Kid’s Stage. Dr. Dog played the Letting Go stage, and the field was packed all the way to the street and beyond. I was relieved to see that guitarist Frank McElroy was not wearing his classic red white a blue beanie in the 85 degree heat. The crowd sang and danced along to favorites like Shadow People, I Only Wear Blue, and Do The Trick. A surprise favorite for me was Flogging Molly, they had the perfect energy to get the crowd amped up for Red Hot Chili Peppers. There was even a gentle vibe to the mosh pit! With no competing music on other stages, everyone tried to stake out a spot at the main stage for Red Hot Chili Peppers Saturday night. The beach was packed way beyond the Sky Bar halfway mark. I was glad to hear all the old Chili Pepper favorites, and less from the new album. There are no words to describe what a 35,000 person sign along is like, but that happened for crowd favorites like Under the Bridge, and Californication. They closed it out with Give It Away, and Flea preaching to the crowd about continuing to support live music followed by the nightly dose of fireworks. Sunday Funday had only a few highlights since we needed so more beach time our last day on the Gulf, as did many other festival goers. The beach was pretty packed until about 5:00 in the afternoon when we all started to rally for returning to the festival. Before the beach, we got up and out early enough to catch the noonish Delta Spirit set. It was the earliest we had made it into the festival all weekend, and although the lines to get in weren’t long, the Letting Go Stage area filled up quick. The energy on stage made this a favorite set to my friends who were not familiar with the band. Vasquez’s energetic leadership around the stage and getting audience participation is a welcome improvement to times I have seen them in the past. Put this band on your “must see this summer list” for sure! We missed Michael Franti’s third Hangout appearance, as well as Cage the Elephant but managed to wander back into the festival about the time Edward Sharpe and the Magnetic Zeros were cranking out “Home.” We got up close to catch the Flaming Lips, who opened with a few of their classics including “Yoshimi” and “Do You Realize.” The rest of their set was playing Pink Floyd’s “Dark Side of the Moon” which also coincided with the solar eclipse. Dave Mathews Band closed out the Hangout with a three hour set, of popular songs and jam sessions. The Hangout 2012 seemed to go off without any major catastrophes or issues. The mood was mellow and relaxed, and as I recount my memories from the weekend, I am ready to get my early bird ticket and do it all over again next year! Check out more photos from The Hangout | 2012.